The image above is the final installment (at least for now) in The Past Present’s Millers Point Series. 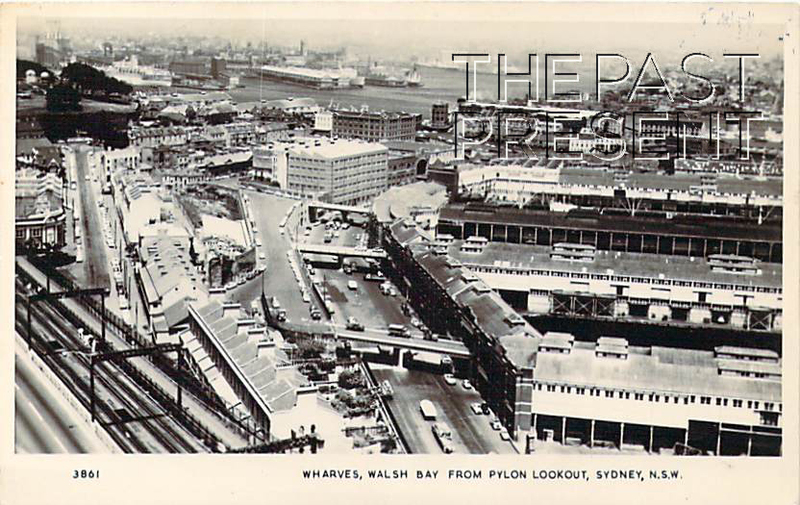 The image, from a postcard dated circa 1935, shows the famous wharves at Walsh Bay which have been so much a part of Sydney’s maritime history in the 20th century. The wharves of today though are of course very different, full of restaurants and up market housing, a far cry from the bustling, working wharves of the past. As the 20th century progressed, the size of the ships and the amount of cargo which they could carry increased, but the number of ships docking at the wharves was in decline. Work for the men working in Walsh Bay and Millers Point became sporadic. The 1930s and the great depression were a time of great hardship for the men working in Walsh Bay. The number of men looking for work was far greater than the number who would find it on any given day. With the construction of the Sydney Harbour Bridge came the prospect of suburban living on the North Shore of the harbour and this made Millers Point less attractive as a place to call home. As the 20th century wore on, the population of Millers Point were aging along with the wharves and by 1975 only 48 children were enrolled in the local primary school, Fort Street. By the 1970s the Sydney Cove Redevelopment Authority had grand plans to redevelop the Rocks area, including ‘West Rocks’ as Millers Point was often referred to by locals. However, community pressure and a slowing of the economy resulted in the saving of much of the area and more recently, the once busy working wharves and the houses of the wharf workers have become much sought after by wealthy investors and homeowners. Millers Point is a fascinating area of Sydney with a rich history. It is also an area which many Sydney-siders are quite familiar with and the photo above is not only evocative of the rich history of the area, but shows how similar certain views remain today. Yet Millers Point has also undergone some of the most drastic changes of any area in Sydney. The 1890s were a time of hardship and turmoil for the people living and working in and around Millers Point. With strikes, depression and the collapse of the wool trade, things looked bleak. The wharves were increasingly insanitary as were the houses. The outbreak of bubonic plague in January 1900 was a heavy blow and became the catalyst for major changes. The area was quarantined, houses underwent compulsory disinfection and anybody suspected of coming into contact with the dreaded disease was sent to the Quarantine Station at North Head under cover of darkness. In the wake of the plague, and the public fear which accompanied the dreaded disease, the government had all the excuse it needed to resume the area, including the wharves, and begin an extensive redevelopment. 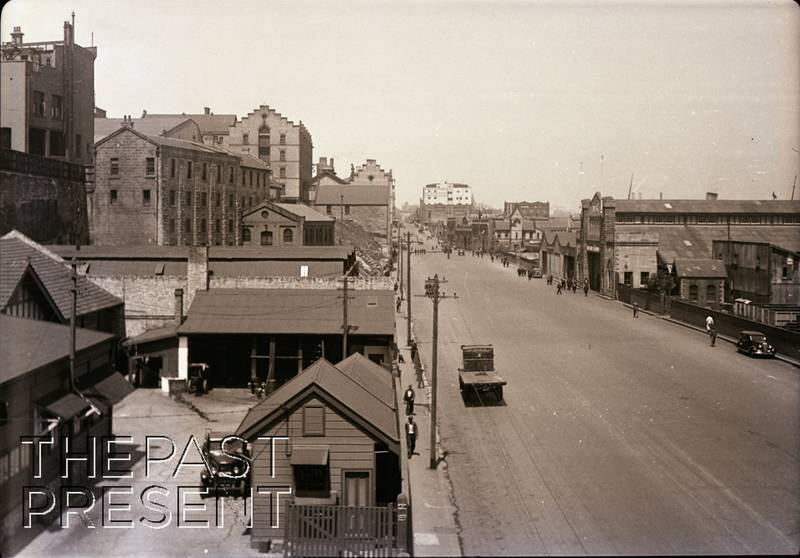 The first priority of the newly created Sydney Harbour Trust was to rebuild the wharves, but they also resumed hundreds of properties and by the 1920s whole streets had disappeared, new cliffs had been constructed and many, many houses had been rebuilt. High Street, the largest grouping of these residential buildings, was even constructed during this period in the wake of quarrying along Hickson Road. These were Sydney’s first public housing, but they were not allocated according to need, but instead given by the Trust to maintain their own workforce. 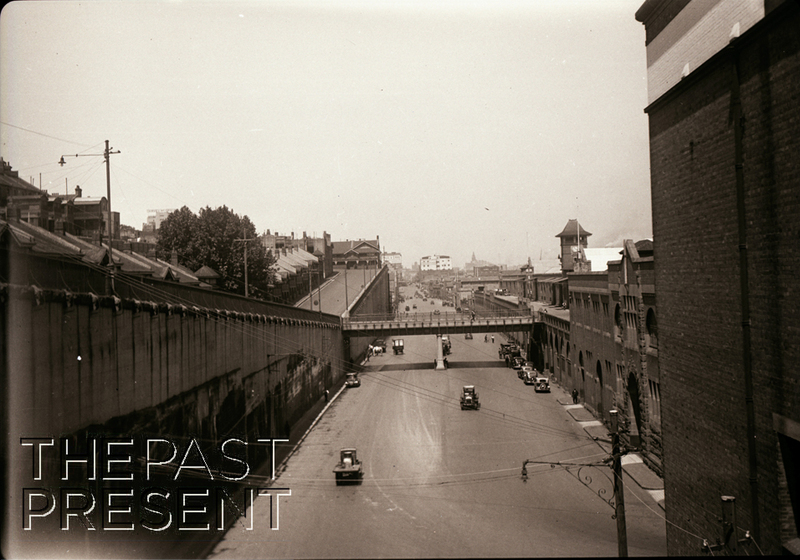 Come back next week for the final installment of The Past Presents series on Millers Point. This week, with the anniversary of VE Day falling yesterday, The Past Present felt it was the perfect time to share one of the later postcards in the collection, dating from World War Two. VE Day, also known as Victory In Europe Day is celebrated on May 8th and marks the end of World War Two in Europe. 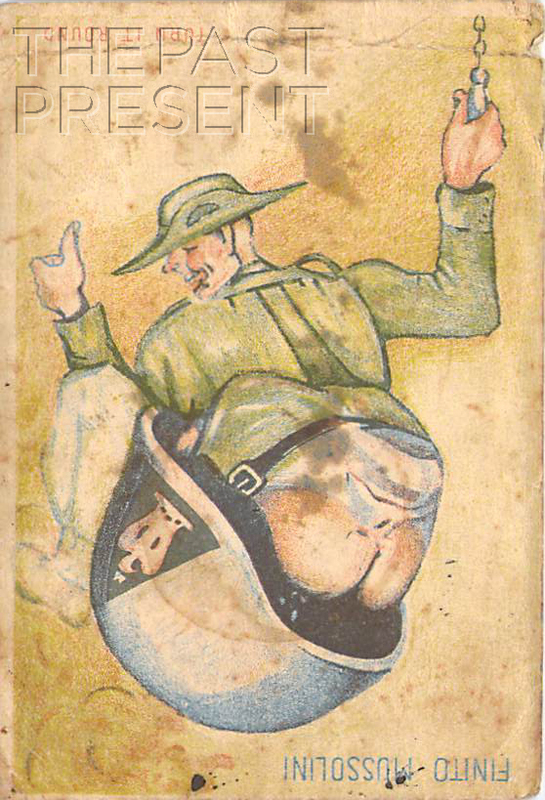 The postcard above dates to World War Two and is an excellent example of not only the type of correspondence used during the war, but of wartime humour. During World War Two (and indeed also during World War One) postcards were a common and important form of communication. The war saw families separated with soldiers leaving to serve their countries with many not returning. Communication between these separated loved ones was very important, not only for those left behind, but also for those serving far from home. Many communicated using postcards, where a brief message could be accompanied by a picture. Often these images were patriotic or encouraging, but many others were humorous, aiming to lift the spirits of those who received them. 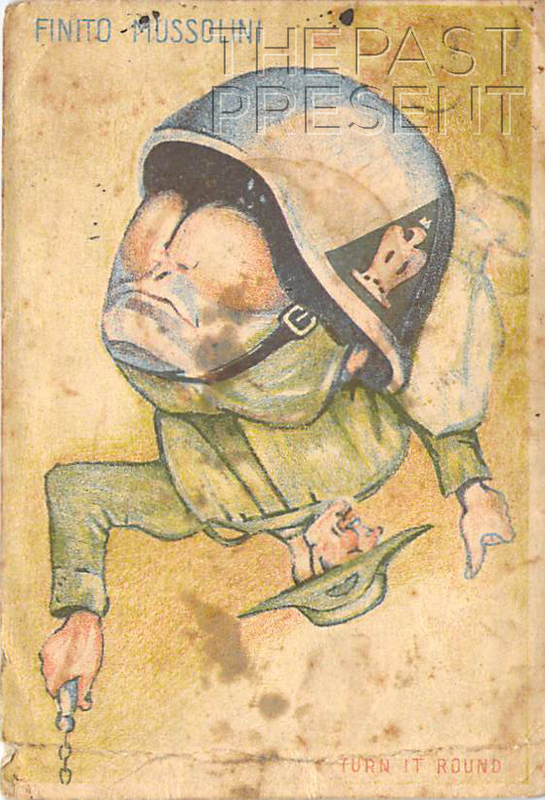 The postcard above (and below) is a fun novelty of the era, showing a caricature of the Italian leader Mussolini if held one way but a very different image if the card is rotated! Yesterday, on May 1st, it was the anniversary of an engineering marvel in Australian history. On May 1, 1889 the first Hawkesbury River Railway Bridge was officially opened, and The Past Present decided it was the perfect time to share the beautiful image above with our readers. 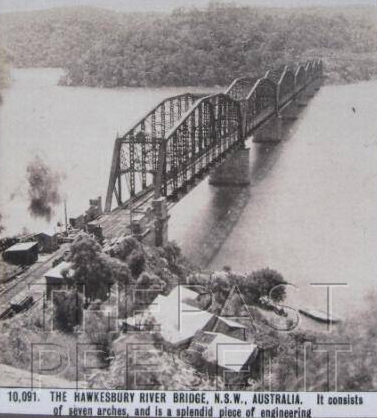 Plans to construct a Railway Bridge over the Hawkesbury River began to be put into action in 1886. The contract was awarded to Union Bridge Company in New York, but various subcontractors were involved in the construction work itself. At the time of construction it was an engineering marvel, with concrete piers below water level giving way to fine sandstone masonry above the water. Five of these piers were also sunk to what were then record depths, between 46 and 49 metres below water level. The bridge was constructed with seven spans and the total length of the bridge was nearly 900 metres. The spans were assembled on Dangar Island and from there floated out to the bridge site, approximately 1500 metres away. In 1927 the bridge needed strengthening, but by the 1930s cracks were starting to appear. In 1946 a new, replacement bridge was opened and the spans were removed from the old bridge, leaving the sandstone and concrete piers as historic relics alongside the newer bridge.